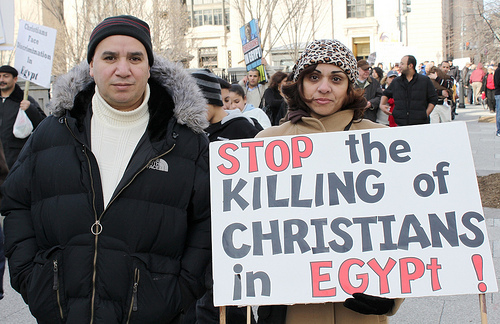 A number of readers wanted to know more about last week’s report on the deaths of Coptic Christians in Egypt. Many Westerners have not been acquainted with the ancient Coptic Church than began in 64 CE when St. Mark came to Alexandria and befriended a shoemaker who in time became their first bishop. Where the first church began now stands a great Cathedral with giant chandeliers. Supposedly, the head of Mark is in a vault in the Cathedral. As reported last week, ISIS attacked the Christians because they are Christians and particularly vulnerable in Egypt with only 10% of the population in a Muslim oriented country where Muslims have a long history of persecuting Christians. Muslim President Abdel Fattah el-Sisi visited Pope Tawadros (the name of the head of the Coptic Church) in Cairo on the Thursday after the attack and vowed to apprehend the parties responsible for the killings. A state of emergency was imposed. However, a local Christian resident responded with the accusation that the state of emergency was called not to protect Copts, but to prevent a revolt by them. For Coptic Christians, this remains an ancient story. Roman Emperors such as Diocletian began persecuting them even in the first century. The remains of many of these martyrs were buried at the Monastery of St. Mina, an hour’s drive from Alexandria. The seven Christians killed in the Sunday massacre were also buried there as a symbol of high honor and sign of respect. Bishop Kyrillos Ava Mina, who leads the monastery, said the seven are now eternally one with the heroic deaths of Christians through the centuries. Will this killing stop? Coptics say no. ISIS has only become a new part of the destructive equation. The issues with the Egyptian government and police are both ineptitude and indifference. Christian experience from across the entire country ranges from apathetic shrugs to outright discrimination. Few Christians ever serve in the top ranks of the military and academia. Egyptian expert at New York’s Century Foundation, Michael Wahid Hanna notes that the highest-ranking people in the country will never be Christians. You are probably asking yourself, “How can this be?” May I recommend a movie that I am telling everyone to see. The Promise is a current well-done movie that is emotionally powerful. The story starts at the beginning of World War I. The basic plot is about what the Muslim Turks did to the Christian Armenians. Once you’ve followed the story line, you will have a deeper insight into what today’s Coptic Christians face in Egypt.